The story of Lima’s Villa El Salvador shows how communities and local governments can work together to make sure that informal development occurs in a structured and ordered way. Photo by Alex Proimos/Flickr. Although Lima’s Villa El Salvador neighborhood was just a dusty plain called the Tablada de Lurín in 1971, it would soon become home to some of the city’s poorest residents. At the time, there were no electricity lines, no wells, no schools and no houses. Now, Villa El Salvador is home to 350,000 people, many of them in multi-story consolidated homes, and literacy and electrification rates are well over the Peruvian average. Two bus lines, a metro, and numerous microbus routes provide transportation to the neighborhood’s residents. The neighborhood contains a federation of small businesses, providing support to furniture workshops and vendors. Though the neighborhood was born from a squatter settlement, it bears little resemblance to the often-invoked images of chaotic, disorderly settlements like the favelas massed in the hills over Rio de Janeiro, or shacks clustered on the river in Manila. More importantly, it does not suffer from the lack of basic services, shortage of public spaces, or disconnection from public transport networks that many slums face. Through a combination of inclusive city policy and effective community mobilization at the neighborhood’s inception, Villa El Salvador transformed from squatter settlement to well-ordered working class neighborhood—all while avoiding the pitfalls experienced by many similar growing neighborhoods. While in some ways a special case, the story of Villa El Salvador illustrates the power of an inclusive, participatory process and a clear vision of the future in facilitating gradual but significant improvements to the quality of life of the poorest urban residents. Villa El Salvador in 1975. Photo by Institute for Housing and Urban Development Studies. 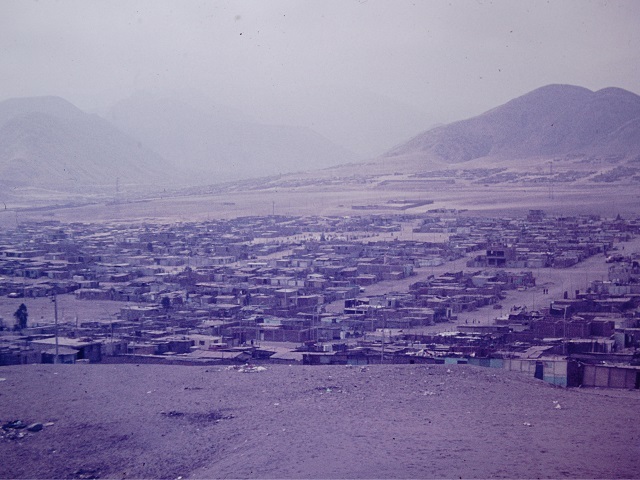 In 1971, 4,000 homeless families occupied a piece of vacant land in the south-central part of the city of Lima, Peru. Guided by the new and progressive “Law 13517” the military government of General Velasco Alvarado worked directly with the community to develop an alternative to eviction for these families. 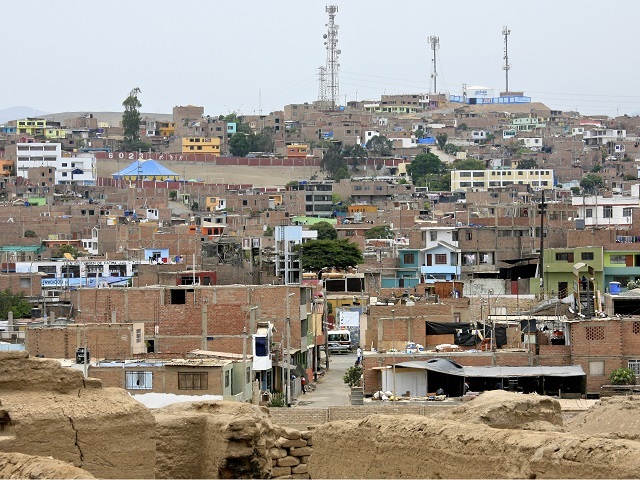 The government surveyed and divided up a large piece of vacant land south of the city, offering lots without services to any family in Lima that needed housing—a type of development which came to be called a barriada asistada (assisted shantytown). These lots were organized into “residential units,” groups of several blocks that featured a central plaza to ensure the presence of public space and to create a natural scale for community organization. Crucially, the neighborhood was envisioned from the beginning not as a residential development but as a city in its own right, with space for commercial activities and microenterprises, an agricultural zone, and an industrial zone. Undeveloped land was left for numerous arterial roads, a provision which allowed trucks to deliver water and for public transport to enter the neighborhood. And finally, the area was equipped with a development plan, created in partnership between the government and local community organizations, which offered a clear vision of the future. Over the first four years of the development, the community organized a strong push for infrastructure improvements and service provision. The government, eager to provide a successful example, quickly provided electricity and elementary schools, and within a year, the population of the neighborhood already stood at 70,000 inhabitants. The neighborhood has continued to grow and improve steadily over the past few decades. 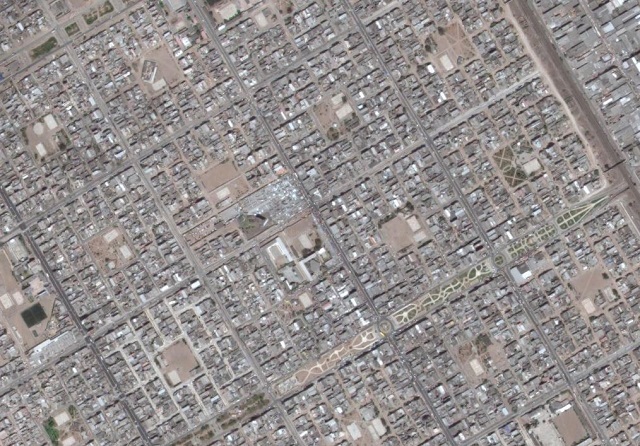 A Google Earth shot of Villa El Salvador shows the grid network that forms the basis of the neighborhood. In 2015, Villa El Salvador is still a relatively poor neighborhood, now containing 600,000 people. However, its original grid has remained intact, its housing is now principally multi-story and made of permanent materials, and it would certainly not now merit the term “shantytown.” The past few years have seen the beginning of operation of Lima’s first metro line, the terminus of which is in the center of Villa El Salvador. The neighborhood is home to a technical university, and has grown to be fully integrated into the larger city. And, the success of this model is not just demonstrated in Villa El Salvador. Some 60 percent of the shantytown population in Lima lives in these types of barriadas asistadas. Villa El Salvador has been internationally recognized as a success story, and has received extensive attention from researchers. The close collaboration between government and community groups allowed for an outcome desirable to both parties, and the skills that the community groups gained through this process were vital in their future negotiations with the state. Additionally, the legal tenure that settlers gained over their land gave them the security and peace of mind they needed to gradually improve their properties through investment. However, Villa El Salvador’s success has been the product of factors which, while they may not be unique, are certainly rare in cities. Few cities are able to make use of such large areas of cheap and undeveloped land and to provide that land to squatters. Additionally, the population that settled in the neighborhood exhibited levels of internal organization not found in all squatter settlements. If this model is to be replicated elsewhere, efforts must be taken to build capacity and facilitate cohesion among residents of informal settlements, and to obtain land at prices that won’t bankrupt local governments. Villa El Salvador is a potent testament to the fact that poverty and disorderly development need not go hand-in-hand. If cities worldwide want to improve the conditions of their poorest residents, they would do well to take note.